Some cats express a strong preference when it comes to protein sources. 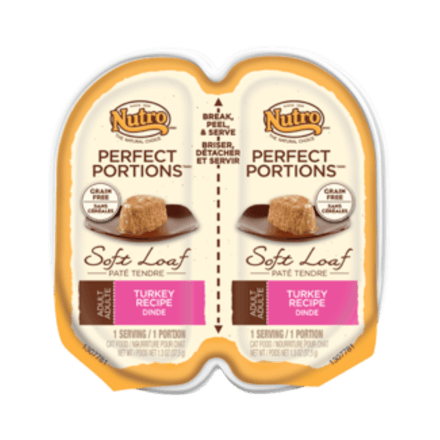 So, the makers of NUTROTM Cat Food offer a lineup of premium canned cat foods with a variety of proteins to satisfy even the most discerning cats. 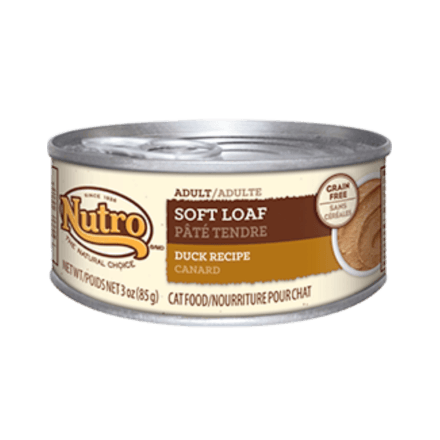 NUTROTM Adult Wet Cat Food Soft Loaf Duck Recipe, with real duck as the #1 ingredient, delivers the ideal nutrient balance cats need. Duck, Chicken Broth, Duck Liver, Pork Broth, Natural Flavours, Minerals (Calcium Carbonate, Magnesium Sulfate, Potassium Chloride, Ferrous Sulfate, Zinc Oxide, Copper Proteinate, Manganese Sulfate, Sodium Selenite, Potassium Iodide), Guar Gum, Carrageenan, Sodium Phosphate, Fish Oil (preserved with mixed Tocopherols), Vitamins (Choline Chloride, Thiamine Mononitrate [Vitamin B1], Vitamin E Supplement, Niacin, d-Calcium Pantothenate, Pyridoxine Hydrochloride [Vitamin B6], Vitamin A Supplement, Vitamin D3 Supplement, Biotin, Vitamin B12 Supplement, Folic Acid), Salt, Taurine. To feed alone: Feed an 8 lb. (3.6 kg) adult cat about 1 ¾ cans daily. 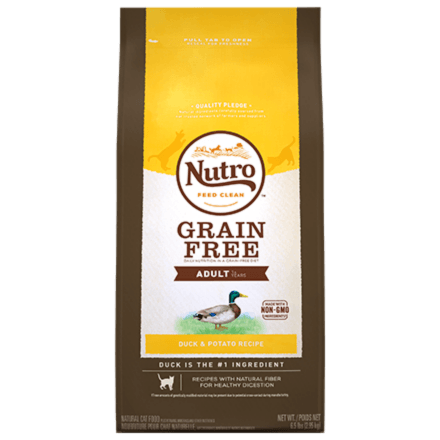 NUTRO™ Adult Soft Loaf Duck Recipe Wet Cat Food is formulated to meet the nutritional levels established by the AAFCO Cat Food Nutrient Profiles for maintenance.